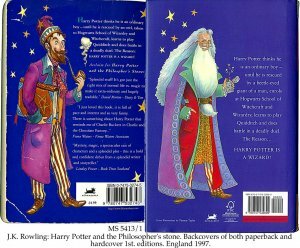 2.THOMAS TAYLOR: ORIGINAL DRAWING OF ALBUS DUMBLEDORE FOR THE BACK COVER OF J.K. ROWLING: HARRY POTTER AND THE PHILOSOPHER'S STONE. 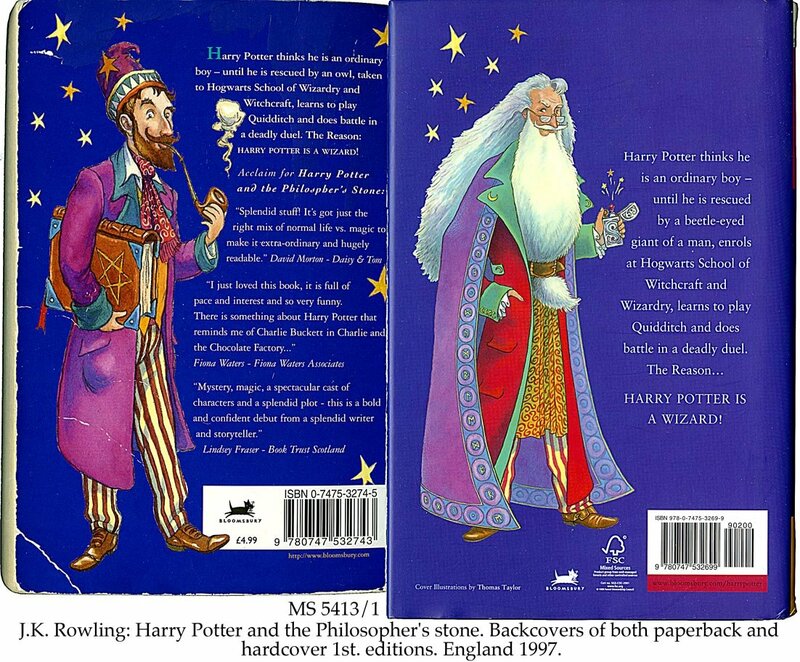 BACK COVER OF THE PAPERBACK FIRST EDITION, AND BACK COVER OF ONE OF ALL THE LATER EDITIONS WITH THE REVISED DUMBELDORE PICTURE. Description	 MS and printed in English on paper, England, 1997, 1 MS p., 19x15 cm, single column, (10x10 cm), 4 lines in cursive script, autograph, signed, drawing 37x19 cm in full colours, inscribed: Albus Dumbledore, Thomas Taylor, 1997. Provenance	 Text 1: 1. Peter Harrington, London. Text 2: 1. Thomas Taylor (1997); 2. Pat McNailly collections; 3. Sotheby's London: Profiles in History, Hollywood auction 33, 11.12.2008:114; 5. Peter Harrington, London. Commentary	 With over 180 million Harry Potter books sold since 1997, J.K. Rowling is today the world's leading writer of children's books. Text 1 is the paperback 1st edition published by Bloomsbury in 1997 in 200 copies only. The covers are uniquely laminated. This first paperback issue is from the same sheets as the hardcover edition, with the same uncorrected text errors. 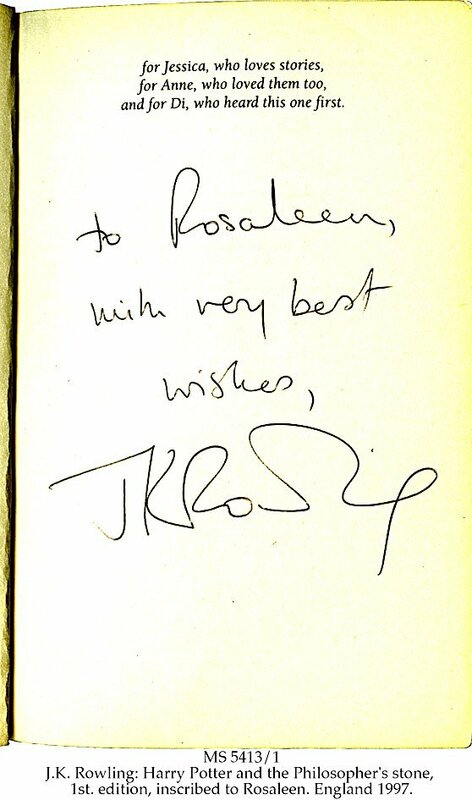 Text 2: When Thomas Taylor made his drawing for the 1st edition of Harry Potter and the Philosopher's stone, he had not been allowed by J.K. Rowling to read the book before the publication, and the rather free fantasy drawing on the back cover of the 1st edition was the result. As soon as he had read the book, he made the present drawing, which has been adopted consistently on all the following editions.